The Cumberland & Dumfriesshire Farmers Mart P.L.C. 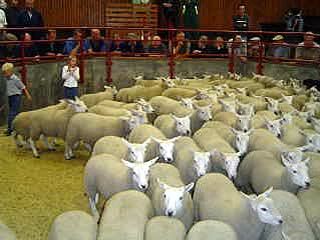 had forward 508 store sheep at their weekly sale at Longtown on Tuesday 29th December 2009. Store lambs easily maintained late high rates. Top of £80 for Cheviots from West Deloraine; Texel £73.50 Kirkton, £72.50 Rinnion Hills; Suffolk £69.50 Cowcorse; Greyface £62.80 Eals; Herdwick £55.80 Watling; Blackface £52.20 Barnglieshead, £49.50 Silloans; Swaledale £49.80 Eals.